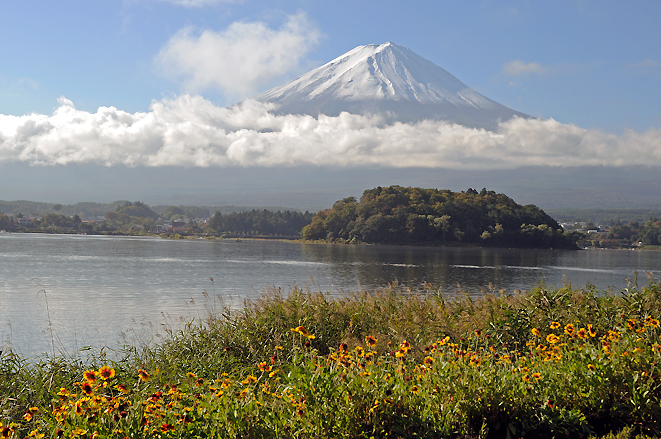 Fuji-san, symbol and highest mountain (3,776 m) of Japan, is part of the "Fuji-Hakone-Izu National Park" and located on the border of Shizuo- ka and Yamanashi prefectures in central Honshû. Dormant since 1707, it is still classified by geologists as an active volcano. Its summit is a crater with a diameter of about 600-800 m and a depth of about 150 m. In the north of Fuji-san are the so called "Five Fuji Lakes" (fuji-go-ko): Lake Yamanaka, Kawaguchi, Sai, Shôji and Motosu.